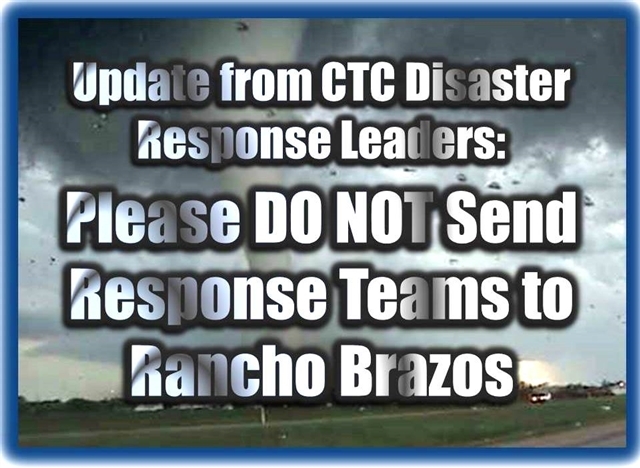 Even though the devastated Rancho Brazos area is open to the public, Central Texas Conference Disaster Response leadership is requesting that churches refrain from sending teams into the area at this time. The situation on the ground is still extremely dangerous and the potential for injury is great. CTC Disaster Response Coordinator Rev. Laraine Waughtal advises that individuals without proper disaster response training not only put themselves at risk, but can cause immediate and long-term complications for homeowners by not appropriately following necessary procedures to make homes safe and secure, as well as adversely affect any future monetary assistance/settlements. In the long run. (and please remember that just like in West and during the wild fires of years past, this is a long process – a process in which we are very involved long after the news cameras have left and the world has moved on), this slows the response and recovery process and creates additional complications which will have to be corrected at a later date when volunteers are often not available to assist. At this time, CTC-trained disaster responders are on the ground assessing the situation and handling emergency relief measures through appropriate protocol for disaster response. When it is advisable for churches to send Volunteer in Mission teams into the area, the CTC Center for Mission Support will advise churches through the conference website (ctcumc.org) and e-mail. Thank you for your compliance with our time-tested methods for ensuring the most appropriate immediate and long-term response as the Body of Christ. For more coverage on the 2013 Spring Storms watch ctcumc.org/springstorms2013. **Laraine is the Disaster Response Coordinator for the Central Texas Conference.